The 2019 NFL Draft is less than a month away. This year’s Draft is in Nashville, Tennessee as the NFL has decided to continue the trend of bringing the draft bonanza around the country (buckle up for Vegas in 2020). 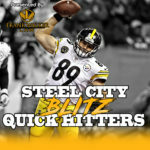 As we have done the last few years, in the weeks leading up to the Draft we will be taking a position-by-position look at the Steelers roster and where their biggest needs lie in the Draft. Today we look at the wide receiver position. With the departure of Antonio Brown, wide receiver became a position of need in this draft. As we discussed a few days ago, Ben Roethlisberger led the league in passing attempts and yardage last year, so continuing to stock the receiver position with young, talented playmakers is essential. In one of the strangest sagas you will ever see this side of Terrell Owens, Antonio Brown forced his way out of Pittsburgh. Brown’s Steelers career ends with him just shy of the team records for receptions, receving yards and touchdowns. Now, JuJu Smith-Schuster will take over the #1 receiving role in his third season in the league. After JuJu, the depth chart is relatively thin. James Washington needs to take a second-year leap in order to make himself a full-time player opposite JuJu. The Steelers signed Donte Moncrief in free agency who has had an up-and-down career to date. At times, Moncrief has flashed the potential that made him a 3rd round pick in 2014 but he has battled injuries and poor QB play over the last few seasons and has never averaged more than 45 yards per game. Ryan Switzer had offseason surgery and should be an even bigger threat out of the slot this season. Eli Rogers was also re-signed to give the Steelers two slot receivers. The Steelers have spent quite a bit of time on some of the top wide receiver prospects during this draft season. There are 5 receivers under contract. The Steelers do not need another slot receiver and will likely add another outside target through the draft. The Steelers have done a good job drafting receivers in the mid rounds over the last few seasons. That said, since 2011 only 5 of the 30 receivers drafted in the first round leaguewide have justified their draft position. While some may want to see the Steelers use their first round pick to address the wide receiver position (including cnic in his latest mock draft), there is plenty of talent in this draft in the middle rounds. It is likely the Steelers will select a wide receiver in the first two days of the draft to add depth to the group in case neither Washington or Moncrief pan out opposite JuJu. As collegiate passing games have become more complex, wide receivers are entering the league with greater ability to make immediate impacts. There is some debate over the top receiver in this year’s draft. 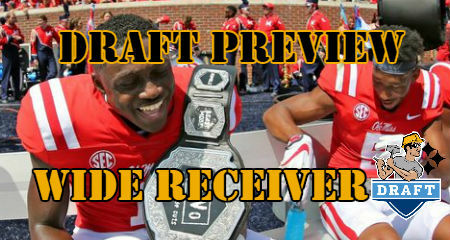 Some love physical menace DK Metcalf of Ole Miss (Prospect Profile) while others think fellow Rebel receiver AJ Brown (Prospect Profile) is the top receiver in the class. The Steelers met with both at the NFL Combine. Iowa State’s Hakeem Butler (Prospect Profile) has also drawn a lot of buzz. The Steelers also sent WR coach Darryl Drake to Arizona State’s Pro Day to scout N’keal Harry (Prospect Profile). 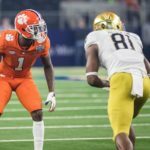 Offensive coordinator Randy Fichtner went to Georgia’s Pro Day after the Steelers met with Riley Ridley (Prospect Profile) at the NFL Combine. The Steelers also met with South Carolina’s Deebo Samuel, Missouri’s Emanuel Hall, and Oklahoma’s Marquise Brown (Prospect Profile) at the Combine who all will likely land on Day 2 of the Draft. Notre Dame’s Miles Boykin (Prospect Profile), a probable Day 2 pick, along with UMass’ Andy Isabella and Oregon’s Dillon Mitchell, likely later round prospects, came to Pittsburgh for a pre-draft visit.